Hooray! Finally, it’s fall. I’ve been waiting for months because I am not a fan of summer in the Ozarks. I mean…who really wants to eat soup when it’s 97 degrees outside? And who wants to build a campfire when it is 101 in the shade? And campfires and soups are some of my favorite things. I’ll share the campfire stories over on campingcapers.wordpress.com. 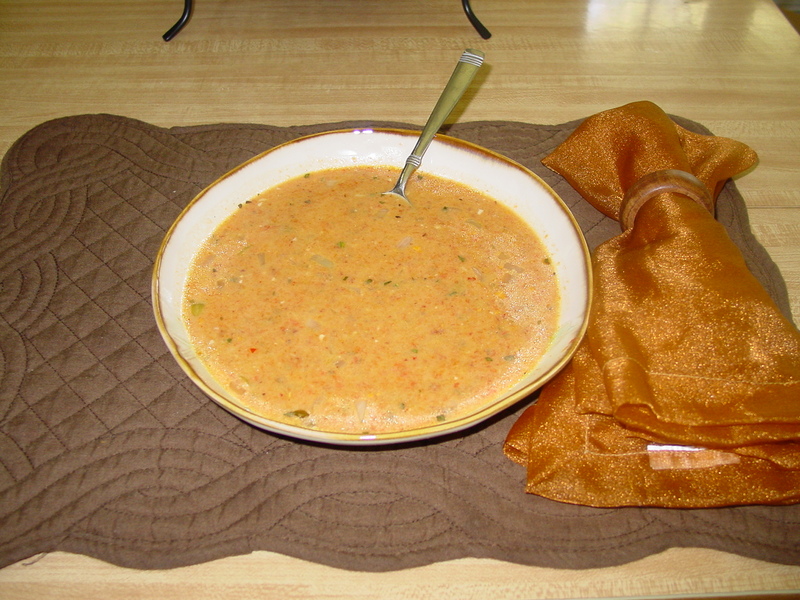 But I’ll tell you about a couple of new soup recipes I’ve tried right here. 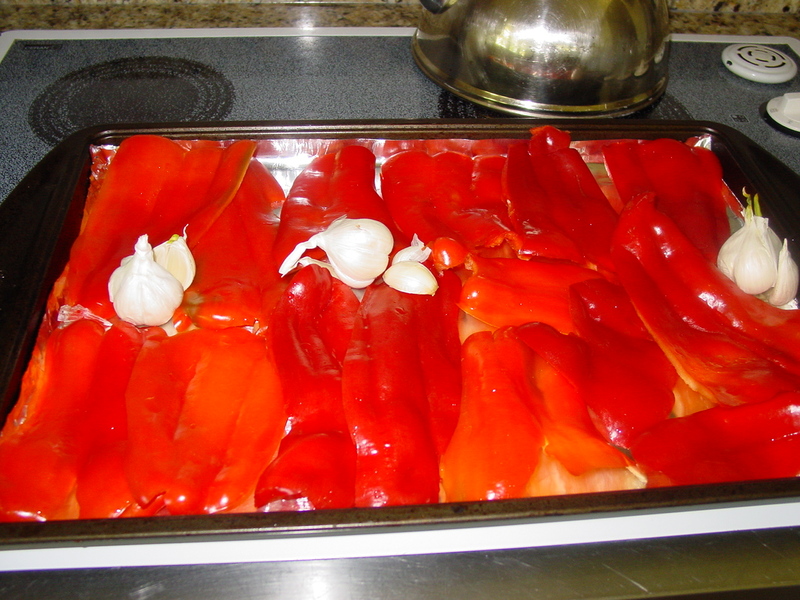 I washed, stemmed, halved, and seeded 8 large red peppers. I placed them on a foil lined cookie sheet and flattened them out so that the skin was exposed to the heat. I put a few heads of garlic on the tray with them. I placed them on the top shelf in the oven and broiled them for 15 minutes, after which I placed the blackened peppers in a glass bowl with a plastic lid and let them steam for another five minutes or so. I peeled away the blackened skin and put the remaining roasted pepper into the food processor along with the roasted garlic and pureed. In my soup pot, I heated two tablespoons olive oil (EVOO) and added a scant two cups of chopped onion, two sprigs of thyme from the herb garden, and a couple of bay leaves. When the onions were translucent, I removed the herbs. At this point, I was supposed to add 4 cups chicken stock. Oops. I had only two. But, I had a creamy garlic soup starter that I had used in another soup recipe I’ll tell you about in a minute, so I used it along with the chicken stock. Progresso makes those soup starters and I think they are really good. After this heated, I added the red pepper/garlic puree, a tablespoon of Mexican Villa Hot Sauce, (because some like it hot, I’ve heard) and a tablespoon of rice vinegar. I sprinkled in a pinch of salt and freshly ground pepper and reduced the heat to let it simmer long enough for the flavors to marry. It was quite tasty, healthy, and could be vegan or gluten free if you use vegetable stock and follow the original recipe linked above. I have no pictures of the second soup I wanted to tell you about, but the other day my friend and I went to lunch at Spring Creek Tea Room. I had the cauliflower soup because I figured it was low calorie and all and might possibly negate the big piece of Coconut Mound Cake I was having for dessert. Not really. I just love soup. It was good! But then, everything Brenda makes at the tea room is good. It was creamy and garlicky, and I thought about it for days afterward, wondering if I could duplicate it at home. If you live anywhere near the Spring Creek Tea Room in Ozark, MO, go there and have the cauliflower soup. And the Coconut Mound Cake. Or any other of the many dessert items Brenda is featuring that day. If you don’t, make this for yourself. It’s pretty good.